Let’s Dive! You can be a Diver too! The PADI Open Water Diver Course teaches you all the skills you need to dive safely and independently. This fun-filled course for beginner divers includes classroom theory, pool dives and at least 4 Open Water dives. 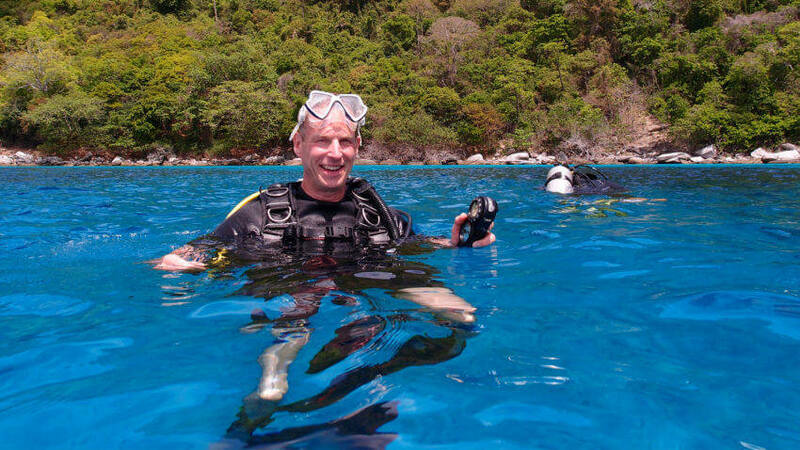 Your PADI certification is valid worldwide, giving you a ticket to adventure. We have a maximum class size of 4 students, or you can choose to book a private course for just 1 or 2 people, giving you closer attention from your instructor. If you want 1:1 instruction, or if you’re a couple looking for a bit of privacy, a private course is for you. We hope to see you here soon! We believe in quality instruction, we do not run rushed 2 day courses and we keep groups small. 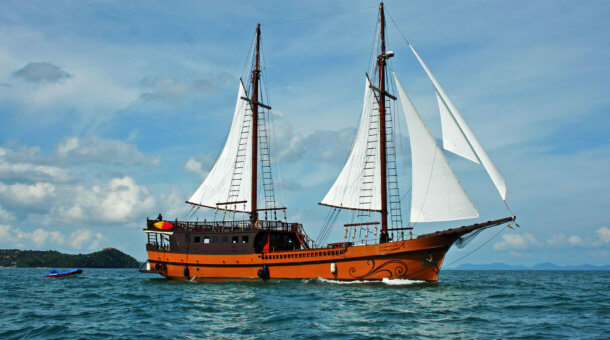 We can run the course in 3 or 4 days, including 2 trips by day trip boat to the islands of Racha Noi and Racha Yai to the south of Phuket or sometimes to Phi Phi. PADI has recently added more content to the Open Water Diver course and we have found from experience that doing the whole course, including theory, in 3 days can be quite tiring. A 3 day course is possible if you have already completed all the theory by e-learning, or if you sign up for a private 1 or 2 student course. Please note that we do not offer beginners dive courses in the Similan Islands National Park. 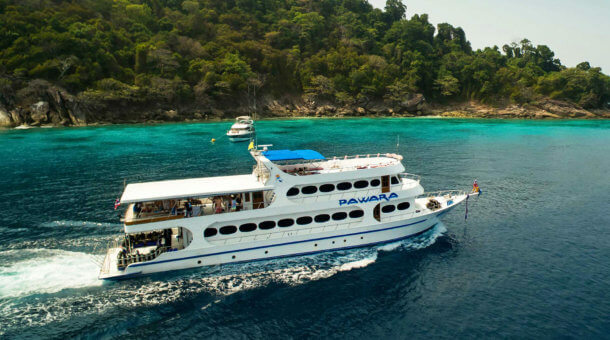 All training dives will be at Racha Noi and Racha Yai Islands. We can dive at the Phi Phi Islands on the last day of the course. Private 1:1 3 day course price is 17,900 Baht. Private 2:1 3 day course 16,900 Baht per student or 4 day course 17,900 Baht per student. Course prices include theory classes in an aircon classroom, pool training in a custom dive pool, 4 or 6 open water dives, equipment rental, certification fee, PADI course manual, log book, breakfast and lunch on boat trips, free Sunrise Divers coffee mug and insurance. How do I get my PADI? Is diving easy? Learning to dive is not difficult. You may be a little nervous at the start, but the step by step structure of the course will take you through basics, then into a shallow pool before letting you loose on the reefs. Most people find out very quickly that diving is one of the most fun activities you can imagine! Here’s how the Open Water Diver course looks. The theory covered in the course develops basic principles and diving procedures. You learn how pressure affects your body, how to choose the best gear and how to plan dives. We try to make the theory fun! 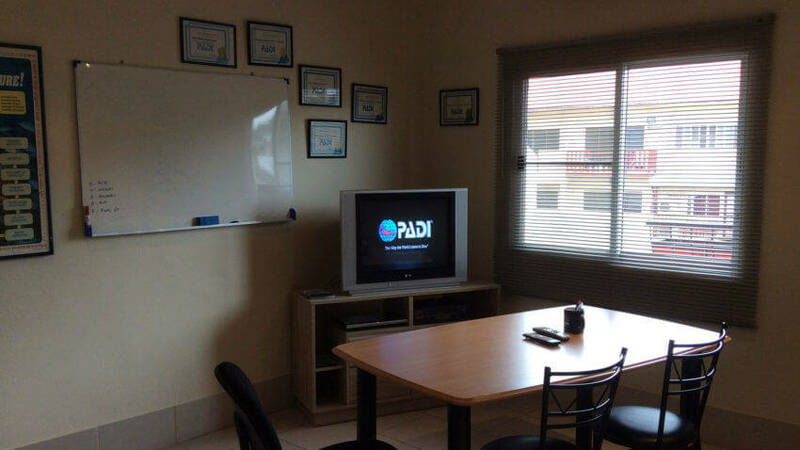 You have your PADI manual to read, plus we watch some DVD’s in our aircon classroom and then you take some simple quizzes and a final exam. Hey, we don’t want to make it too easy! You can get started on your Open Water Diver course any time – just sign up for eLearning at PADI.com – this can save you holiday time – if you have completed all the theory in advance, you’ll be ready to get straight into the water, no messing around in classrooms on holiday, plus with eLearning you can do the theory in your own time. The charge for eLearning is about 175 US$ – this is paid to PADI, not to Sunrise Divers. Here in Phuket we’ll complete the course in 3 days, with no classroom work except a quick review quiz. 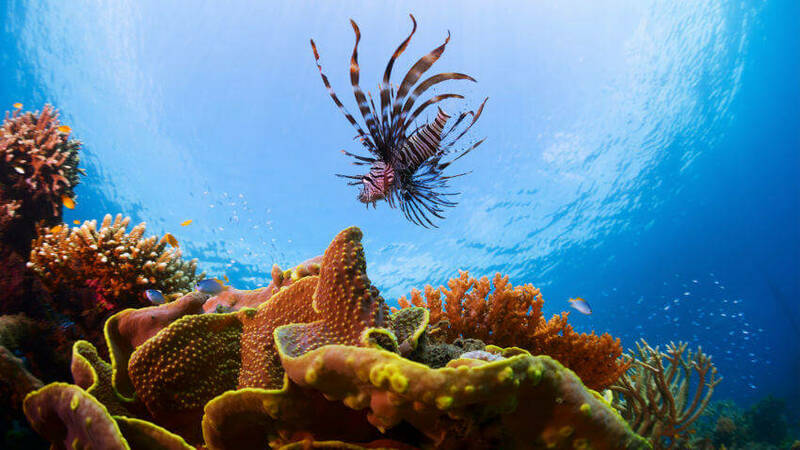 You can start the PADI Open Water course any time by completing theory online using PADI eLearning – learn at your own pace, at home or anywhere you take your laptop or iPad. You can sign up for eLearning at the PADI Website, or contact Sunrise Divers for more information. If you do all the theory at home, there’s no need to sit in a classroom on holiday! You’ll be in the pool on the very first day of your course. 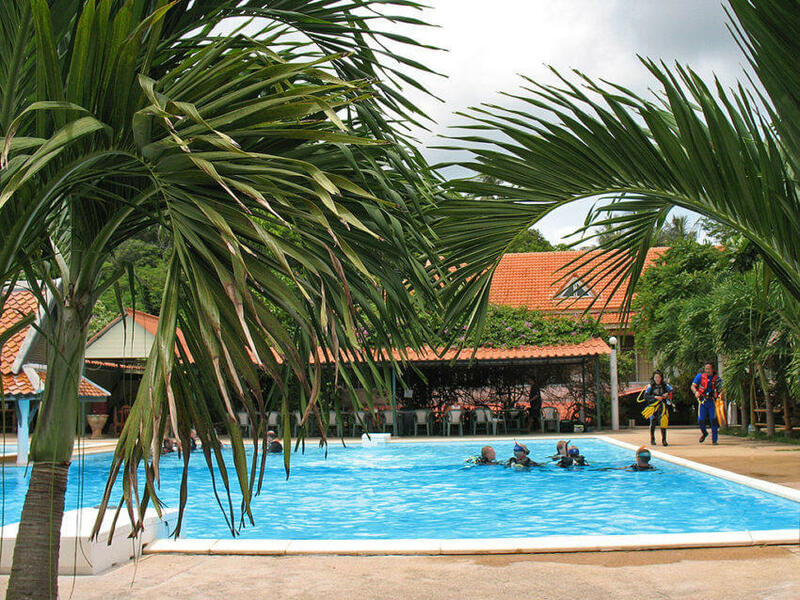 The pool sessions cover a wide range of basic dive skills such as setting up your gear, clearing water from your mask, buoyancy control and proper entry techniques. You also practice some emergency skills, like sharing air (just in case). Oh and there is a swimming test too. You do need to be able to swim to take this course. By the time we’re done in the pool, you’re ready to hit the ocean with a splash! After your confined water fun, you will make five open water dives (note : the course only requires 4 dives, we throw in 2 more dives for free!) over the course of 2 days with your PADI Instructor. When we say “open water”, we mean the beautiful blue ocean! You start shallow and gradually go deeper. The maximum depth in the course is 18 meters. Now you can experience real underwater adventure! 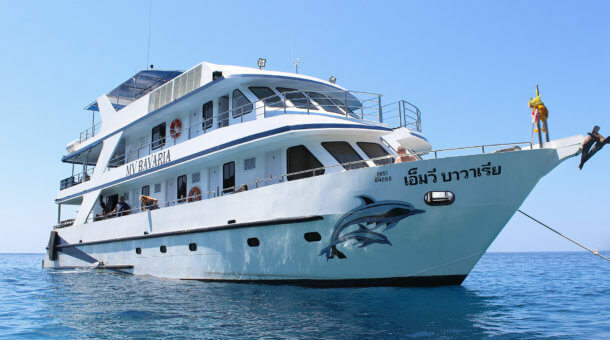 We make dives on full day boat trips to islands near Phuket. Day 3 : Start 7:45am, pick up from hotel, diving 2 dives at Koh Racha Noi, return about 3:30pm. Day 3 : Start 7:45am, pick up from hotel, diving 3 dives at Koh Racha Noi and Racha Noi, return about 6pm. Note : if e-learning is complete, the only theory we do is a short review quiz and then straight to the pool! Note 2 : Lunch at the pool not included in course price, there is a cafe with Thai or international food, lunch likely to cost you about 100 – 150 Baht. On day 1 please meet at our dive center 9am. We suggest that you stay close to Sunrise Divers (we are at Karon Beach) when making your course. On day 2 and 3, pick up is from your hotel, pick up time 7:45am based on hotels in Karon or Kata Beach area. Pick up also possible from Patong. If you stay in other areas of Phuket there may be an extra pick up fee. Day 4 : Start 7:45am, pick up from hotel, diving 2 dives at Koh Racha Yai, return about 3:30pm. Day 4 : Start 7:45am, pick up from hotel, diving 3 dives at Koh Racha Noi and Racha Yai, return about 6pm. On day 1 and 3, please meet at our dive center 9am. We suggest that you stay close to Sunrise Divers (we are at Karon Beach) when making your course. On day 2 and 4, pick up is from your hotel, pick up time 7:45am based on hotels in Karon or Kata Beach area. Pick up also possible from Patong. Other areas of Phuket may have an extra pick up fee. Start time on day 3 is flexible, depends how much you get completed on day 1! It’s also possible to swap days 2 and 3. 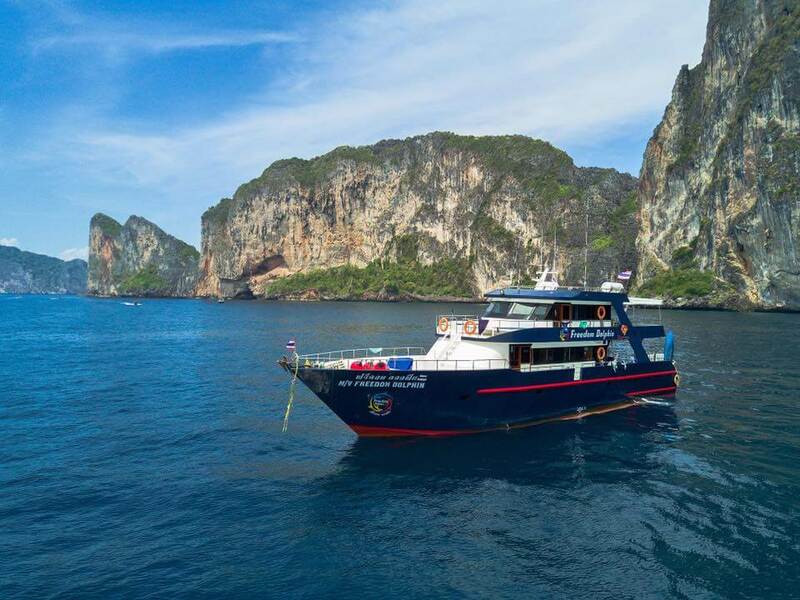 We also offer a referral course, which means you can complete all the pool and classroom work at home, then come to see Sunrise Divers and make the open water dives to gain your PADI Open Water certification in Thailand. The course takes just 2 days so you can maximise your holiday time. For more details see Open Water Referral Course. YES! 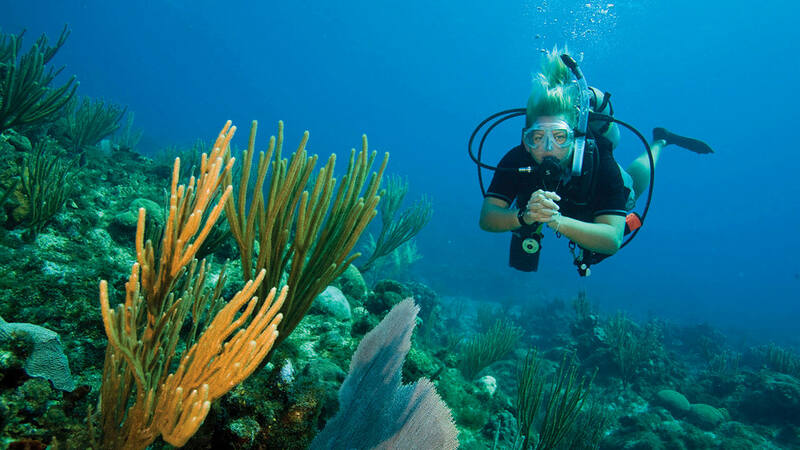 You don’t have to be an Olympic swimmer to learn scuba diving. Most of the time you are wearing scuba gear such as fins and a BCD (like a jacket which you can fill with air), so there’s not much need for normal swimming. There is however a swimming test to make sure you are happy in the water. You need to be able to swim 200 meters or 300 meters with mask, snorkel and fins. There is also a 10 minute float test. In general you should be comfortable in the water and you should be fit and healthy with no medical issues. Can I Dive if I Cannot Swim?